After a one-year hiatus, the Parade of Lost Souls is back, and seems to be bigger than ever. This year, they even blocked off part of Commercial Drive for the event, which features incredibly elaborate pagan– and death–themed costumes, as well as more conventional costumes — the mad scientist! the undead viking! girl-Elvis! the Prince of All Cosmos! newlydeads! Borat! terrorpuppies! inexplicable demon-things! While there wasn’t nearly as much house-decorating along the parade route as previous years, there were some delightfully morbid displays. And of course, fire, fire, fire. My own camera battery died after about 5 pictures, but that’s okay: it’s more fun to participate than document. And I stumbled onto this pretty cool video from a couple of years back, which does a better job of capturing the spirit than my grainy digicam shots can. girl pumpkinheads, originally uploaded by Mister Wind-Up Bird. I love Halloween. Oh sure, it’s a mass-marketed, consumer-driven holiday, but it allows you to be more creative than, say, Easter. 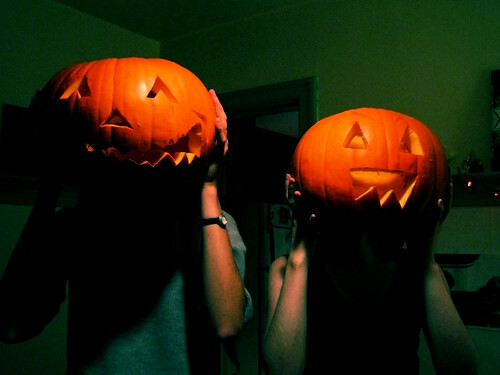 Behold the pumpkin heads of Florence and Gillian. Though unlike last year, I don’t think the kommune decorations will extend beyond our family of jack-o-lanterns. There aren’t even any parties I’m especially interested in going to, which would make 2006 the first in many a year I didn’t slather on the latex and fake blood. The song tells the tale of a man who travels in time to save mankind, but in the process is turned to steel, to an iron man (although iron is not the same as steel and the song also states that his boots are made of lead). This form leaves him in a vegetative state where it is unclear, if he is even still alive. It is presumed that he’s dead, so everyone ungratefully just leaves him there, however Iron man is still alive. Lying there in his metal shell he plans vengance on the people who don’t acknowledge his heroism. Finally the time comes, Iron man lives again, and alone he goes on a dreadful rampage killing everyone. From the Wikipedia entry on Iron Man (song). God bless Wikipedia. And God bless Guitar Hero, for making me wonder what the hell that song is about, anyway. I’m about 4 years behind on my teevee watching (I only just got around to seeing The Office), so I haven’t seen Extras yet, but between this clip of David Bowie humiliating Ricky Gervais through song, and the one with Patrick Stewart’s disturbing screenplay, it already ranks as one of the sitcom with the best single-scene high points. So I spent a goodly chunk of this past weekend devouring The Uncanny X-Men Omnibus, a mammoth book collecting several years worth of the Claremont/Byrne run lent to me by labmate Mike. And while I’m enjoying the hell out of it, and the second half, in particular, it far better than almost anything else Marvel was doing at the time, I have to admit, it’s pretty stupid. By one of them wacky coincidence thingees, the AV Club blog has a longish post about … well, I’m not exactly sure what the main thrust is, but it addresses a lot of the problems I have with both superhero and alternative — or, in the 21st century, “art” — comics. Worth a read if’n your into that kind of thing.